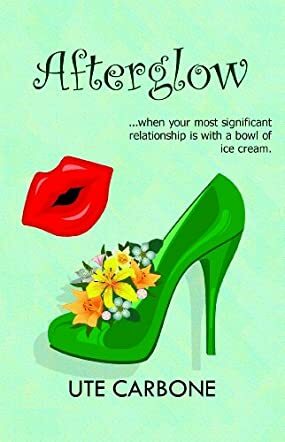 Afterglow is the story of kindergarten teacher India Othmar and her battle to permanently break up with Cherry Garcia. We meet India shortly after she finds out her husband of 30 years is cheating on her. With a younger woman. Who used to date their son. Needless to say, the woman has earned a bit of time with Ben & Jerry. Luckily, India's best friend and man-eater, Eva, refuses to let her wallow in self-pity for too long. Ute Carbone has crafted some wonderful characters, particularly in Eva and India. The women are loud, proud, loyal, and honest to a fault, and getting a glimpse into the inner workings of their friendship is a pleasure. Following India as she hires a divorce attorney, whom she dumped for her soon-to-be-ex, and finally stands up to her meddling mother-in-law. Despite her heartache at ending a decades-long marriage, India turns out to be a much stronger woman than even she knew. Afterglow is a comedy gem, particularly as India suffers from bad date after bad date, at the urging of her best friend. Then there are India’s children who have returned home, Patch the ex-boyfriend of his father’s current lover and Allie, back in the nest after a trip to Africa. Ute Carbone did a magnificent job of dealing with the subtleties and nuances India had to cope with as her entire life was in transition. Ending a relationship that was a huge part of her life and re-entering the dating scene, while trying to find the happy medium between being a mom and being a woman was expertly written. Learning how to deal with one another in their new roles was difficult, but Carbone handles it with aplomb.